Over the past decade, China has become an increasingly appealing investment destination for private equity fund managers worldwide: $20bn was raised by China-specific funds in 2017 YTD (as at November), over 3x the amount recorded in 2007. The rapid growth of the Chinese private equity market has led to a shift in the proportion of capital raised by China-focused vehicles by fund denomination, from USD to RMB. So, what are some of the factors that have contributed to this shift? Before 2009, most overseas and domestic GPs raised China-focused private equity funds in USD for two reasons: firstly, to attract foreign investment in the country and, secondly, to facilitate overseas listing (typically in either Hong Kong or the US) as an alternative exit route to the Chinese stock market, which sometimes experiences halts in IPOs. As illustrated in the chart above, RMB-denominated private equity vehicles focused on China have been securing greater proportions of investor capital than other currencies post-GFC, rising from a low of 12% in 2007 to a high of 83% in 2009 and, more recently, 80% in 2017 YTD. The launch of ChiNext and National Equities Exchange and Quotation in 2009 and 2012 provided RMB-denominated venture capital and growth funds in China with additional platforms to recoup investments in companies in the region. This, in turn, has bolstered investor appetite for funds targeting start-ups with growth potential, with the aggregate capital raised by such vehicles increasing from $5.3bn in 2009 to $8.4bn in 2017 YTD. Regulations introduced in Beijing, Shanghai, Chongqing and Tianjin post-GFC –that permit foreign firms to establish wholly foreign-owned enterprises as GPs to raise RMB-denominated funds – will also have encouraged further investment in China, with favourable tax treatments offered for these types of vehicles. Examples include California-based venture capital firm Lightspeed Venture Partners, which launched Lightspeed China Partners RMB I alongside its USD-denominated fund Lightspeed China Partners III. The RMB-denominated vehicle held a final close in May 2017, securing CNY 600mn. Furthermore, government guidance funds, which typically hold significant sums of capital, also play a leading role in leveraging social capital and encouraging local investors to commit to such vehicles. For example, Infotech National Emerging Industry Investment Guidance Fund, a venture capital fund focusing on the Chinese consumer services and technology sectors, held a final close in March 2017, securing CNY 9.2bn. 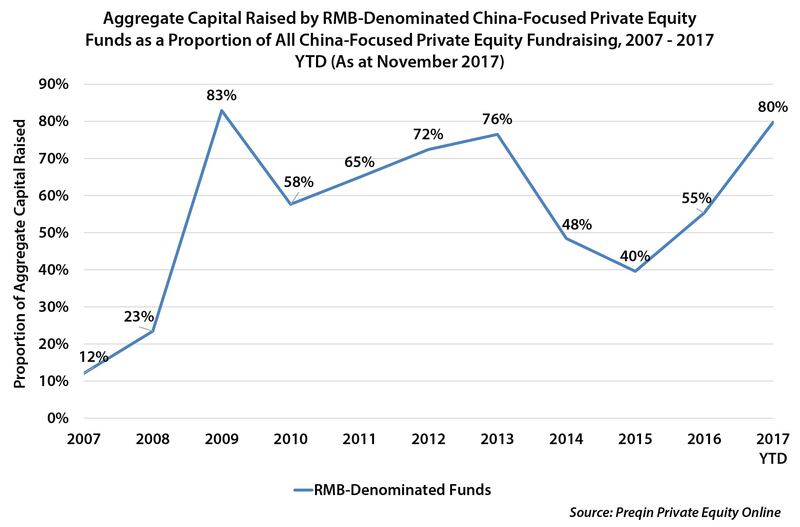 RMB-denominated funds look set to continue their dominance in the private equity fundraising market, mostly due to favourable policy initiatives that are in place. The proportion of aggregate capital secured by such vehicles, compared to all other currencies, has recently risen significantly from 40% in 2015 to 80% so far in 2017. As the Chinese economy continues to grow, and more regulations are introduced, both domestic and foreign institutions look set to increase their private equity investment exposure in the region.